Want to move your custom domain Blogger blog from HTTP to HTTPS? There is a good news for you! Blogger has finally introduced a free SSL certificate for custom domains which makes your website more secure. Earlier, this feature is available for blogspot blogs only. Moving to HTTPS connection can also make your website rank higher in search engine results. You might have noticed that Google is giving more priority to HTTPS enabled websites. This tutorial will guide you how to enable HTTPS on your custom domain Blogger blog. Let's first discuss what is SSL certificate and the difference between HTTP and HTTPS. We share a lot of personal information such as email address, passwords, bank details etc., with various websites. On a HTTP connection, the data is usually transferred in a plain text which is vulnerable to be hacked. SSL (short for Secured Sockets Layer) adds an extra security layer to your website by establishing a secure connection between your user's browser and your web server. The usage of SSL technology ensures that all data passed between the web server and browser remain encrypted. An SSL certificate is required to create SSL connection. It contains information about your website and the issuing CA (Certification Authority). When browser attempt to load any SSL enabled website, first it verify the authenticity of the SSL certificate and then encrypts the data. How HTTPS is better than HTTP? HTTP is short for Hyper Text Transfer Protocol. On the other hand, HTTPS stands for Hyper Text Transfer Protocol Secure. As name itself suggests, HTTPS is the secure version of HTTP. 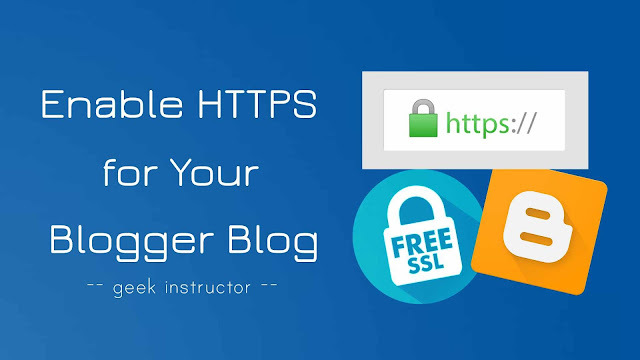 Instead of sending the data in a plain text (like in case of HTTP), HTTPS uses SSL connection to encrypt the data between a web server and a browser. It adds an extra security layer and makes your website more secure. You will find a small green color padlock icon in the URL tab of HTTPS enabled websites. By clicking on this icon, you can get information about the SSL certificate of the website like which CA (Certification Authority) issued the certificate, when it is going to expire, and more. Protect your visitor's data - Your website may be collecting user information indirectly through some third-party services. Adding an SSL certificate to your blog will keep your user's data safe. Increase SEO ranking - HTTPS also has some SEO advantages over HTTP. Around 70% of websites on Google's first search result page are HTTPS enabled now. Increase conversion and organic traffic - Some people prefer to browse https enabled websites only. If you don't want to risk losing any organic traffic, you should definitely add SSL on your custom domain Blogger blog. Remove Google Chrome warning - Google has officially announced that websites without a SSL certificate are not secure for browsing. Google Chrome browser will also mark all HTTP websites as "Not secure" in the upcoming version. Look more pofessional - The green color padlock icon in the URL tab will give a professional look to your website. It builds user trust. Blogger is offering free SSL certificate for both custom domain and blogspot blogs. Unlike WordPress, you don't have to setup any third-party CDN (Content Delivery Network) on your Blogger website. First, login to Blogger Dashboard. 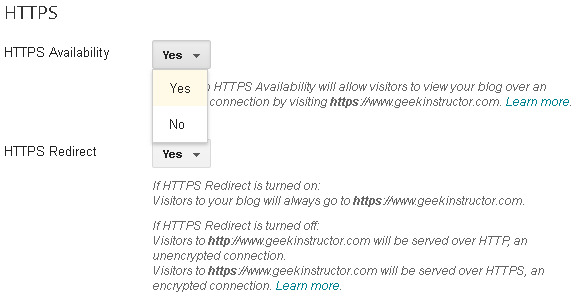 From the HTTPS availability drop-down, select "Yes" and save the changes. It may take some time to setup HTTPS (SSL certificate) on your Blogger website. Next, you have to enable HTTPS redirect feature. This is an important step to redirect your visitors to the new encrypted version of your website. Note: If you have a blogspot blog, HTTPS is automatically enabled by Blogger and the HTTPS settings are hidden. First, go to Google Webmasters and login to your account. 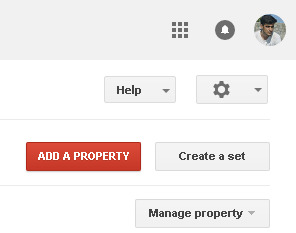 In Search Console Home, click "Add a property" option. After this, tap the "Add" button. If you have already done your site verification, you will be moved to the Search Console Dashboard. Now you have to add a new sitemap of your Blogger website. Click the "Sitemap" button on the Dashboard and then tap "Add/Test Sitemap" button. 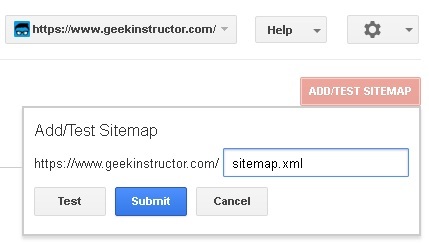 After this, type sitemap.xml in the URL field and click "Submit" button. That's it. Mixed content error occurs when an SSL certified web page contains both encrypted HTTPS and HTTP content (images, scripts, videos, links etc.). This can affect your site performance, user experience and cause security issues. To fix the mixed content errors, you have to replace all these HTTP links with HTTPS in your Blogger template, posts, pages and gadgets. Read this guide on how to properly fix mixed content errors in Blogger. We hope you find this guide helpful in moving your custom domain Blogger blog from HTTP to HTTPS. If you are facing any problem, feel free to share it in the comment section.